Musings Over a Barrel: Have You "Stolen" Any Glassware Lately? Last Tuesday I stopped by Capital Ale House for "Steal the Glass Night." Every Tuesday they feature a brewery's beers served in logo glassware, which you are free to take with you. Even though I probably have more glassware than I need, if that's really possible, I do stop by for the Tuesday events on occasion and "steal" a few glasses. I've gotten some interesting glassware in this manner. One of my current favorite glasses is the Brooklyn Brewery snifter I picked up at a previous Steal the Glass night. This week the featured brewery was Kona Brewing from Kona, Hawaii. 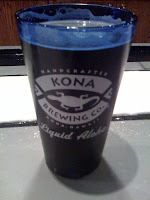 Two Kona beers were being served in cobalt blue "shaker pints". While the shaker glass style isn't my favorite, they are very utilitarian, and quite handy for Summer festivities. This particular glass is attractive, though the color does make it hard to see the color of the beer inside. Wailua Wheat and Fire Rock Pale Ale were on tap for the event. I opted for the Fire Rock Pale Ale. This is a mild, but nicely balanced pale ale. Easy to drink and refreshing after a day at the office. Next Tuesday, June 2, will be a very special Steal the Glass Night featuring Sierra Nevada Brewing. In addition to Pale Ale, Summerfest, Torpedo Extra IPA, and other Sierra Nevada beers, all Capital Ale House locations will feature I.D.E.A. – India Dark Elusive Ale. Capital Ale House's own Chris and Rachel went out to the brewery in Chico, CA and brewed this beer at "beer camp". Tuesday evening will likely be your only chance to try out this limited, one time, brew. Max's Tap House in Baltimore do the same thing on Wednesdays. I go every week (my day to hang after work) and get my pint glass. They also come in handy for my friends housewarming gifts (esp when they build a bar into their place). I currently have about 60 of them. Too many favorites to list. Missed it last night. I too have a Brooklyn snifter, used to have two before a tragic dishwasher accident. My glassware is one of the few things I am bringing with me from the Czech Republic to VA - no way would I be without my Chodovar and Purkmistr glasses. My wife refuses to let me bring home another glass until/unless I lose, give away, or break any of the ones (has to be over 100 by now) already in the house, with certain case-by-case exceptions. I've taken to taking my own sampler glasses to beer festivals in hopes of either losing or breaking one. The least favorite glasses are in the heaviest rotation just in hopes that they'll be the proverbial "sacrificial lambs".